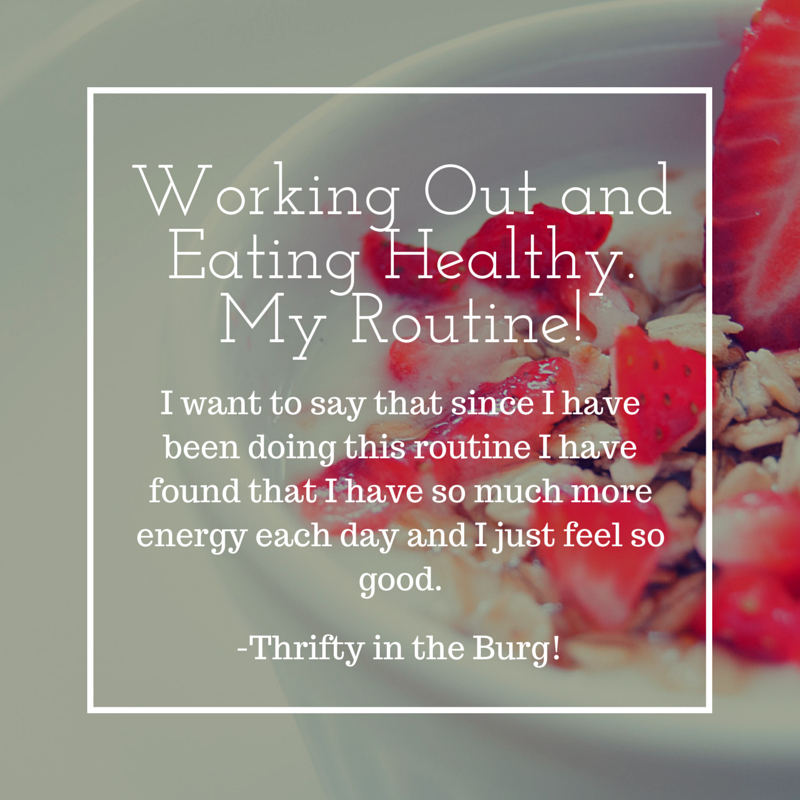 Thrifty in the Burg: Working Out and Eating Healthy, My Routine! Working Out and Eating Healthy, My Routine! Sorry about the constant background changes but I am trying to find something that I really like while keeping it simple. I have this vision of what I want my blog to look like but I can never seem to find it! If you have been following my blog and have seen the different changes, let me know which one you have liked best so far. Or maybe some suggestions. That would be really helpful for me! This week has been going so good. So far. (I don't want to jinx myself!) Last week I decided that I was going to start working out and eating better. Couponing has filled my cabinets with junk and very quick, unhealthy foods. So I decided to plan out my meals for this week and do my best to keep it cheap and using my rebate apps and some coupons to help keep the cost down. My shopping trip consisted of chicken (not frozen), shrimp, zucchini, asparagus, mushrooms, blueberries, strawberries, bananas, and a few other healthy items. I have been doing really good at keeping up the healthy eating and I have been able to keep myself motivated enough to keep it going. 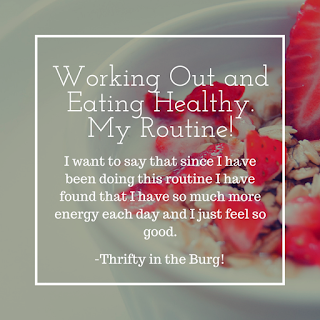 I thought it would be fun to share my daily routine that I am getting myself into and share some of the yummy foods I have been eating. I have been starting my morning off with a bowl of oatmeal with a tiny bit of brown sugar, cinnamon, 1/2 of a banana sliced into my oatmeal, and blueberries as well. I love this to start my day because it keeps me full and gives me so much energy to keep going. It also just tastes so yummy! If I get hungry in between meals I will eat a yogurt or a banana and peanut butter for a snack. My lunch has been a sandwich of some kind. 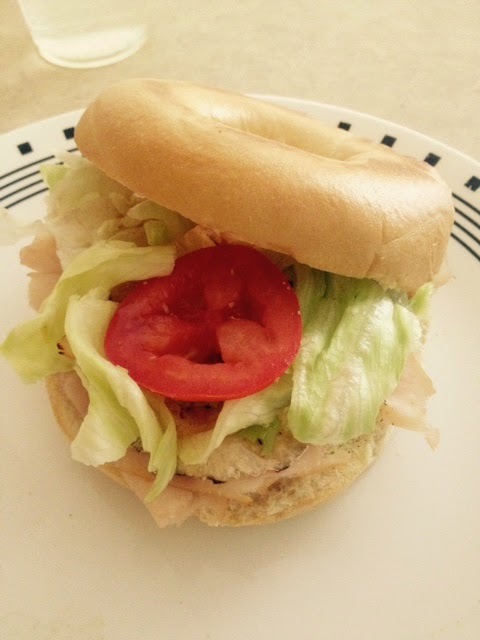 I have been doing a bagel, turkey, and cheese sandwich. I toast it in the over, (I don't have a toaster) and then add lettuce and tomato to it. It is so good and filling. I love it with a bit of Italian dress on it. Perfection! At about 4 I do a workout. Lately I have been doing Zumba on Youtube. I love Zumba because not only is it fun but it is high cardio and really gives me a great workout. I then will end my workout stretching and cooling down. My dinners I try to make with a meat of some sort and always have a green vegetable. Last night was lemon ranch chicken with asparagus and rice. It was so good and I found a , kind of inspiration, recipe on interest and tweaked it a bit. I always have to add my own thing to a recipe! Tonight's dinner was lemon pepper shrimp with zucchini noodles and some of the left over rice from last night. I was so surprised with this dish. I was not expecting the zucchini to be so good with the shrimp but it was! And it was so easy to make. This meal was fairly inexpensive to make. The zucchini cost about $1.22 for 3. The shrimp was only $5 and I only used half of the bag. The mushrooms were only like $1 for a few. The spices and lemons I had on had already but would only add another dollar or two. If I get hungry between dinner and bedtime I will eat a yogurt or a bowl of multi-grain cheerios. That is basically my eating and exercise for the day. I hope this post wasn't too boring for you all. I want to say that since I have been doing this routine I have found that I have so much more energy each day and I just feel so good. My mood has been more positive and happy. If you wan't any of the dinner recipes please let my know. If you need some ideas of healthy meals go to pinterest and start a new board for your healthy eatings. What kind of foods do you eat through the day to keep up your energy? Do you have a workout routine? Please leave comments! yum this looks like a fantastic day of eats! I love starting my day with oatmeal too! Zumba has been a passion of mine for a few years- what an awesome workout! Thank you for the comment! I didn't discover Zumba until I started college and found a Zumba class on campus and then I just fell in love with it! It is so much fun! Aren't zucchini noodles really good? Shredded carrots with zucchini is yum too! I work out 5-6 days a week: 2 days of body pump (weight training), two days of HIIT (one outdoors now that it's nice), one day of combat and the 6th day is usually up in the air. Often I take weekends off to recover and let my muscles simmer down. For diet, I follow the paleo/primal diet and I've leaned out about 10-15 just from cutting out grains, sugar, dairy and processed food. It works well right now for me. Be careful with bagels, they essentially turn Into a ball of sugar and cereals are full of sugar. When I'm feeling snackish, ill eat almonds (no more than 15-20) or have a piece of fruit or water. Most of it is psychological and you think you're hungry when you're really just bored. Good luck :) wish we had all these coupons/apps/grocery store programs up in Canada. It's redic how expensive everything is here compared to the U.S. Thank you for leaving a comment! When I saw the recipe for the zucchini noodles it looked so good but I wasn't sure how good they would taste. They are so yummy! Who would have thought, right?! Thank you for sharing your routine and sharing some tips. Hopefully they will get a roll on those coupons/apps/programs in Canada soon! I wish I could say I eat healthy, but I don't. I'm in a rut of just not taking the time. I do workout 5-6 days a week, a combination of weight training, TRX strap workouts, and cardio every day. I do a short run and a long run each week. I do prefer nuts for snacking, and I am going to try the warm lemon water thing. Your zucchini noodles look fabulous. I have been wanting to try them, now I'm feeling inspired! Thank you for the comment Jennifer! I love when readers leave me comments. It helps me to better connect with my readers. I highly suggest the zucchini noodles! They were delicious! And easy to make. I'm glad you got inspired to try them! I hope you like them! With more and more people becoming conscious about health, the demand for healthy lifestyle products has increased tremendously.